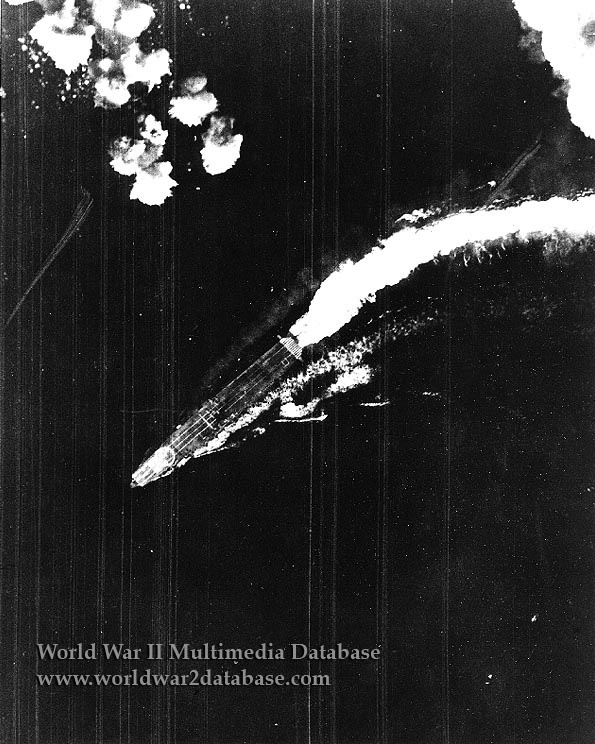 American bombs from 20,000 feet splash all around IJN Hiryu at 0814 Hours as she maneuvers to avoid three sticks dropped by a flight of USAAF B-17E bombers. This composite group of fifteen aircraft, designated Flight 92, is from the 31st and 431st Bomb Squadrons, 38th Bomb Group, 7th Air Force and is led by USAAF Lieutenant Colonel Walter C. Sweeney, Junior. Sweeney is in the B-17 nicknamed "Knucklehead." Lacking training and experience, the B-17 crews let loose their bombs individually and without coordination. Two planes carried eight 600-pound bombs each and the rest eight 500-pound bombs each. Japanese fighters were reluctant to engage the B-17 because of its heavy defensive firepower. Captain Cecil Faulkner's B-17 is the only one attacked; losing his number four engine, his tail gunner is shot in the index finger, the only American casualty from Flight 92. Antiaircraft fire is heavy but inaccruate, following the planes as they made their approach from the northwest on the sterns of the ships of First Air Fleet. Sweeney's group claims twelve hits, but after the war an examination of Japanese records shows that while some ships were near-missed, not hits were scored. The B-17 attack did delay the landing of Lieutenant Joichi Tominaga's returning planes from Midway. This helped to increase the congestion of planes, bombs, torpedoes and fuel on the Japanese carrier decks, which would lead to their destruction when Douglas SBD Dauntless dive bombers would attack later that day, sinking three of them within five minutes at 1020 with bombs planted amid the jumble of rearming aircraft. B-17s were not a good platform for antishipping attacks from high altitudes, because of the need for large numbers of aircraft to adequately perform saturation bombing of a target. Much more success was gained using "skip-bombing" attacks at low altitudes or specialized dive bombing from on high.